Fill a large stock pot with water and allow to come to a boil. Add the sliced lemons to the water and the cleaned trimmed artichokes. Allow to cook for 10-15 minutes or until one of the leaves of the artichoke can pull off easily. When done drain and allow them to cool. 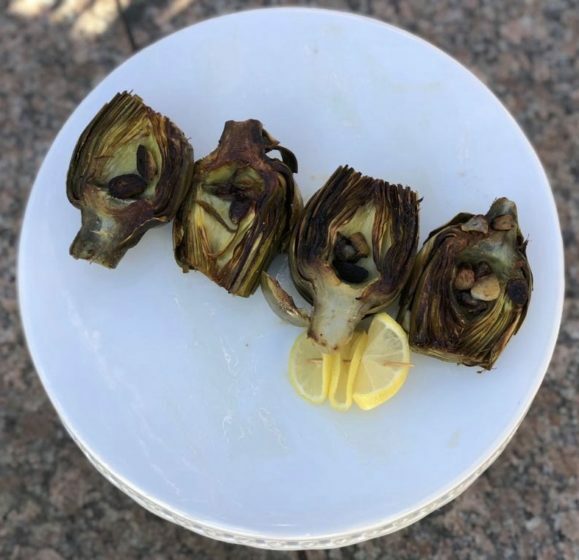 Cut each artichoke in half and using a spoon scrape out the inner pointy leaves and the hair leaving the meat of the artichoke and outer leaves intact. (Start here if using frozen artichokes they might need to cook a little more to get crispy). In a cast iron skillet pour a layer of olive oil (don’t be stingy) and turn heat on high. When oil is hot and glistening put in the artichoke seam side down. Fry them for about 3-4 minutes until they get crispy then flip them over. Once flipped squeeze the fresh lemon and add a sprinkle of salt. Remove from pan and finish with a dusting of freshly grinded black pepper.